This is an incredibly satisfying and savory burger. I was both eager and hesitant for H to try this because she loathes both mushrooms and onions. To my profound relief, because I want to make these again they were so good, she loved them. And yes, I said them. She has had more than one over the past few days which is really the ultimate test needed to confirm that something is a hit. This burger is a definite home run that would satisfy a meat eater’s appetite. Not only did it have insane flavor but it had a real burger texture and didn’t fall apart as some veggie burgers can. I slathered the toasted whole wheat bun with Wildwood’s Garlic Aioli and reserved some grilled mushrooms and onions to top this monster [I left those off of H’s burger, that would have been pushing it]. 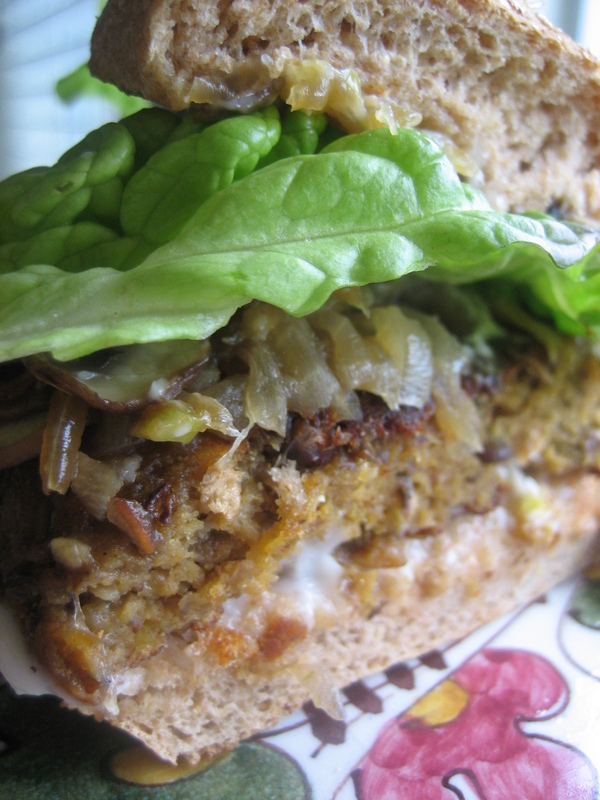 It really was the most satisfying burger I’ve had in years and is our new go-to veggie burger. 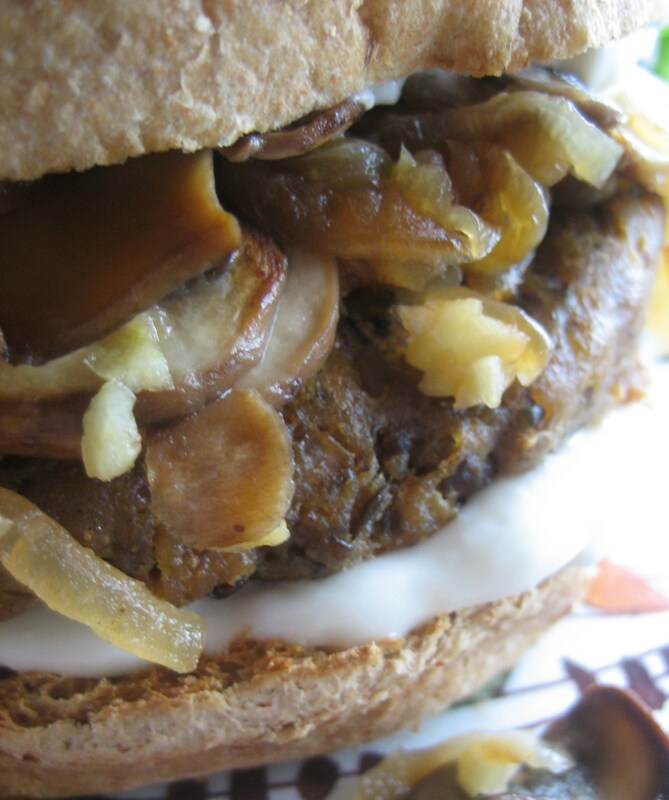 If you want to add sauteéd mushrooms and onions to the tops of the burgers, which I highly recommend, you shall need to double the amounts of onion and mushrooms required for the recipe in order to reserve them for a condiment. This recipe yields 8 burgers, of which extras can easily be frozen for future meals. Caramelize the onions, mushroom and garlic in a pan over medium low heat. [This will take a while but it is well worth it flavor-wise. Add the onions first and when they become soft add in the mushrooms and then the garlic in the last 5 minutes or so.] Add to food processor and pulse a few times. Add 1/2 cup cooked lentils, peanut butter, soy sauce, worcestershire sauce, mushroom broth and steak sauce. Pulse until all are well incorporated yet keeping in mind that you don’t want a homogenous paste. You want to retain some texture from the mushrooms. Add in the remaining 1/2 cup lentils but do not pulse. You want the lentils to remain intact for more texture. In a bowl combine the dry ingredients and mix well with a whisk. Add the wet to the dry and knead lightly into a dough. Cut into 8 equal pieces and shape into patties. In a skillet over medium-low heat, cook each side for roughly 10 minutes to both brown and cook the burgers throughout. I’m glad you like them Tofu, I think we’re both kindred kitchen spirits. This recipe is so good it’s scandalous. Right on! I’m glad you loved it because it’s become one of our favorites as well.